We should probably say something about what this "Microfinance" or "Microcredit" thing is that we're working in with Friendship Bridge and Kiva.org. The amazing man who won last year's (2006) Nobel Peace Prize pioneered the use of tiny loans without a requirement for collateral or security to poor people. Mohammed Yunus maintains with great success that if you just give poor people access to capital, they can make their own way in the world with their own businesses. His book, Banker to the Poor, is worth every minute of the time you take to read it - it's in every library and every bookstore and here on Amazon.com. It's the most hopeful book about poverty in the world that you will ever read. Yunus, with 25 years of experience in this, maintains that poor people pay off their loans at a much higher rate than the rich ones, and that simply providing capital in amounts like $100-$500 can transform the life of the poor by enabling them to start their own tiny businesses. Friendship Bridge is a microcredit organization operating along the lines of Mohammed Yunus's Grameen Bank. It makes small loans with no collateral requirement to poor women in western Guatemala. We're riding around the entire region interviewing these women and seeing a little of their lives. And Kiva.org is an upstart that has found a new way to fund the loans offered to the poor by microcredit outfits like Friendship Bridge - by bringing the stories of the poor right to the web browsers of the richer parts of the world, so they can make loans right from their computers. The money loaned by gringos is then channeled through microcredit organizations like Friendship Bridge to the poor who need the loans. 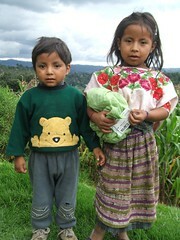 We sure encourage you to get involved with microfinance by making a loan (or many of them - it's addictive) on Kiva.org or making a gift on FriendshipBridge.org.